SKU: SC S24. 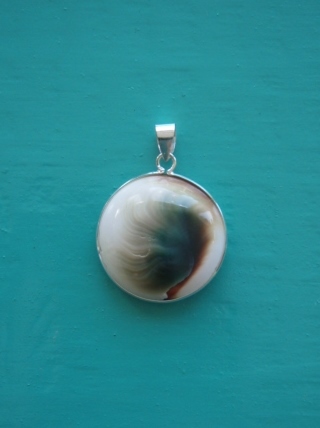 Categories: Pendants, Shiva Eye. 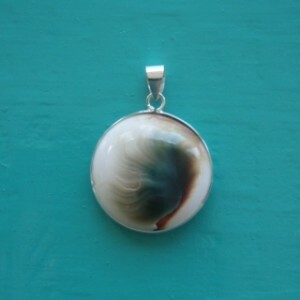 This medium sized Shiva Eye Pendant is our most popular size. Adding to its popularity is its two sides. 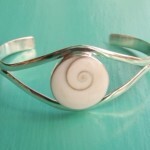 The official name for a Shiva Eye shell is ‘Operculum’. Its the doorway to a Turban Snail! On the outside it shows its ‘eye’. 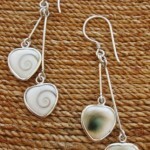 The brown/green/red feathery pattern on one side of the pendant is the eye. 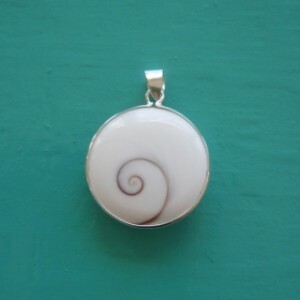 On the inner side as its sits on the Turban Snail is the white background with the spiral. 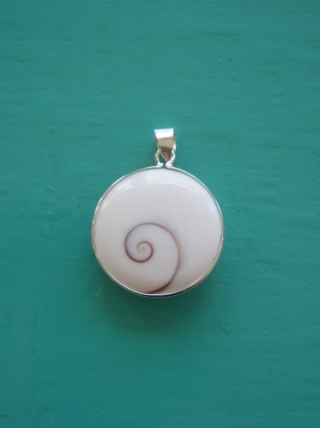 This is the other side of this pendant. Before you ask, it’s completely natural and not painted on! The wonder of nature huh? 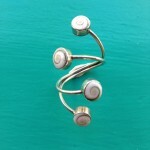 Set in Sterling Silver this pendant will become a classic piece in your jewellery box.